(ii) assembles staves, which have been hollowed, backed and jointed by cooper's machinist (486) q.v. ; passes hoops over assembled staves, and inserts and hammers in heads, but leaves hoops to be hammered tightly by machine barrel driver (499) q.v. a cooper q.v. who is employed in bonded warehouse at docks in upkeep, repair, and storage of full casks. a cooper q.v. who makes casks or barrels for cement, groceries, and other non-liquid goods. a cooper (wet or dry) q.v. employed in a cooperage, or at a manufacturing establishment or warehouse in any industry where casks or barrels are used, and is wholly or principally engaged in repairs. a wet cooper q.v. who specialises in making runlets, i.e. small casks or barrels for milk, wine, vinegar, etc. a cooper q.v. who makes casks or barrels for holding liquids. makes buckets, churns, wooden pails, and other fancy goods of the coopering craft, using tools and methods similar to those of cooper q.v. a white cooper q.v. who makes washing tubs. hammers head, i.e. four sections of shaped wooden board, into end of cask, resting upon hoop which has been inserted by liner-in q.v. ; sometimes also fits in an additional head made of cardboard, before wooden head, to make keg dust proof. receives split saplings that have been soaked in hot water or steamed in steam chamber; passes them through roller machine, which he turns by hand, to give a slight inward curve, then bends them, by hand, on a frame of whatever size hoop is to be; binds ends of hoop with hemp. (ii) in Westmorland, see hoop maker, and hoop bender. splits saplings of hazel, chestnut or ash and makes them into wood hoops for coopers; see hoop bender. bends sticks to shape, by steaming, for use in making roofs of railway carriages, and the like. a cooper q.v. making kegs, or small barrels. general term for any workers engaged in making Guelph kegs, i.e. cylindrical wooden vessels made of two or three layers of veneer, including machinist (Guelph kegs), liner-in (Guelph kegs), header-up (Guelph kegs), and liner-off (Guelph kegs) q.v. receives unfinished Guelph keg from machinist q.v. and puts it in trough of specially constructed hollow bench; nails wooden hoop with hammer and nails, at a specified distance inside edge or lining of keg, which is then ready for header-up q.v. nails a final wooden hoop upon head of keg, with hammer and nails, to keep head in position. lays two or three layers of narrow boards of veneer, horizontally, to form base on cylinder of keg-forming machine, rotating cylinder slowly, segment by segment, by means of treadle levers; clamps boards down with adjustable iron clamps; lays narrower strips of veneer vertically at right angles to horizontal pieces, slips iron hoops over this second set of strips to hold them in position, and clamps them down with adjustable iron clamps; punches holes in iron hoops with hammer and punch, to receive nails, and nails binding strips to base; trims off edges by bringing two small power-driven circular saws, one at each end. into contact with them, by moving hand lever or treadle; removes iron clamps, and takes keg from cylinder on which it has been built up. scrapes or shaves inner and outer surfaces of casks, by hand, with a two-handled shave knife or with a steel scraper tool; work usually done by cooper q.v. ; cf. finisher (coopering) (498). examines used casks or barrels, on return to brewery, distillery, etc. ; taps staves with a hammer to discover if they are sound, and marks, with chalk, staves, heads, etc., which need repairing or chops pieces out of defective staves, etc., to call attention to defects; examines them again when returned from repair shop, and sends back for further attention if still defective. slips a temporary wooden hoop over staves of uncompleted cask or barrel, and hammers it down with hammer and driving iron, to force staves close together; cask is then ready for permanent iron hoops to be put on in same way. 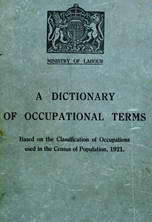 takes out heads of casks for cleansing purposes, for repair or for removal of contents; usually done by cooper (477) q.v. a vat maker q.v. who erects, in brewery, large vat or back which has been made in cooperage, and taken to pieces for convenience of transport. a wet cooper q.v. who makes large wooden tubs or tanks, for brewing and the like, called vats or backs.